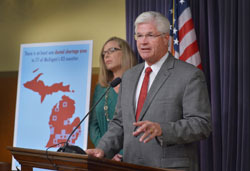 LANSING, Mich. — Sen. Mike Shirkey introduced legislation on Thursday to address the limited access to oral health care faced by millions of Michiganders. Senate Bill 541 would allow dentists to treat more patients by hiring a mid-level provider, called a dental therapist. “Many areas of Michigan have a shortage of dental providers,” said Shirkey, R-Clarklake. “This problem even affects Branch, Hillsdale and Jackson. Under SB 541, dentists could choose to employ dental therapists in their practice. Dental therapists would be similar to a physician assistant on a medical team and would work under the supervision of a dentist. Dental therapists could provide preventative and routine restorative care such as filling cavities. Seventy-seven out of Michigan’s 83 counties have at least one dental shortage area. Shirkey said the creation of a mid-level dental provider makes sense from both a public health and fiscal perspective. “The Legislature should be about ensuring those practicing in our state are qualified to provide care, and after those qualifications are met, we should get out of the way and let the market and consumers decide how that care is provided. SB 541 has been referred to the Senate Committee on Health Policy.